Jerusalem police investigators arrested three suspects on suspicion of arson of two parked vehicles. The detention of two of them was recently extended by a court. 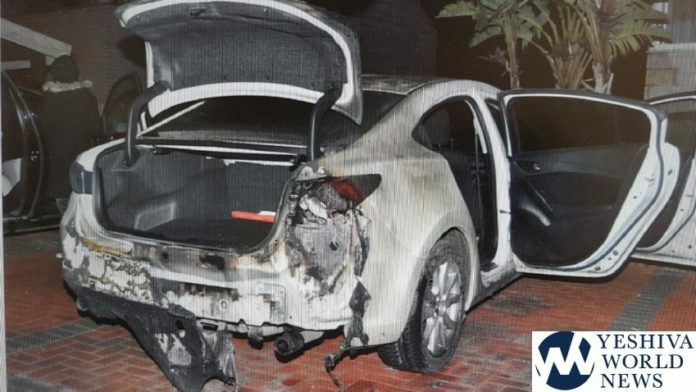 The police investigation began with a report that alerted the policemen at night on January 7, 2019, to an address at Mevasseret Tzion, where two parked vehicles were set on fire and the suspects fled. Investigators initially made one arrest, and the continued probe led to the arrest of two additional suspects. The forensic evidence recovered at the scene led to the identity of a key suspect in arson. Police report the motive for the attacks was criminal and not nationalistic in nature, apparently caused by a monetary dispute between the suspects and the victims. The detention of two suspects, ages 24 and 31, was extended by the Jerusalem Magistrate’s Court until February 17th, and the arraignment of the third suspect is set for Tuesday, February 12, 2019. The attached photo provided by police shows one of the vehicles after an attack and the accompanying video shows police in action after a vehicle is set ablaze.